Focal length: you need a long lens to produce a picture of the sun filling a significant part of the frame. The same is true for moon photography, as both are about the same size. Caution: With a DSLR, NEVER look directly into the sun through your viewfinder! This will likely burn a hole in your retina. For this reason, I prefer mirrorless cameras to photograph the sun. You will need a lens with a focal length of at least 800 mm (35 mm equivalent), better 1000 mm. Using my trusty Nikon V1 on a 80-400 mm Nikkor resulted in a focal length equivalent of 1080 mm. The sun was big enough with this combination. I could have added a 1.4x teleconverter, but I felt it was not needed. The bigger challenge are the filters. I started with a Lee Big Stopper (a 10 stop ND filter), but I had to add another 4 stop ND filter to finally get pictures where the sun was not overexposed. This solved the exposure problem, but you can imagine what happens when you point a lens with two filters in front of it directly towards the sun – LOTS of flares. You can solve solve this by positioning the sun off-center. This will move the flares the opposite side of the frame. In the end, I did cut out the sun from three different pictures and combined them to the picture shown above. 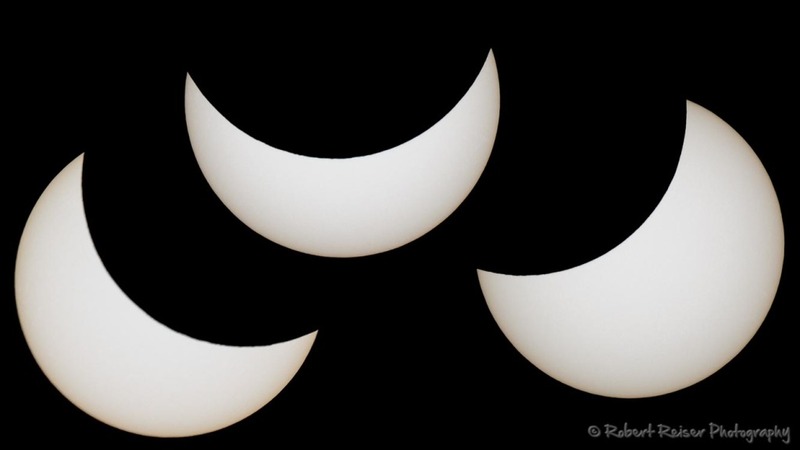 Honestly, solar eclipse pictures are pretty boring when you record them using visible light – it is just the shape that makes the picture interesting. You can get much more interesting pictures of a solar eclipse using a Hydrogen-Alpha (Hα) filter – just look at some solar eclipse pictures using a Hα filter.